Short lead (226 out of 250 characters): Picture a real-time global wave based on measuring success, with solutions delivered for personal gaps in optional Active Knowledge. With Expandiverse Technology everyone can rise to greatness, so greatness will become normal. Long lead (413 out of 400 characters): A fully digital planet will transform how we live, earn, spend, learn, solve problems and be entertained. Picture a real-time global wave based on measuring success, with solutions delivered for personal gaps through optional Active Knowledge. 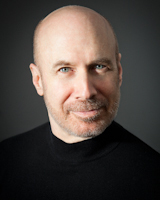 Continuous online communities will add larger and more powerful solutions. 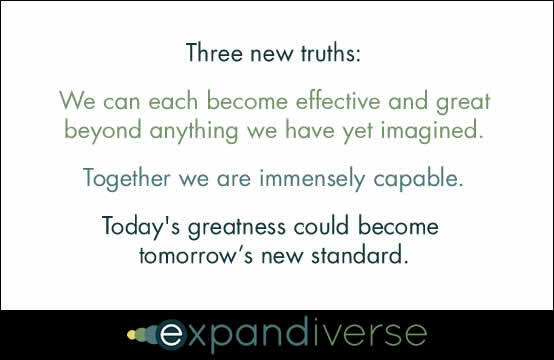 With Expandiverse Technology everyone can rise to greatness, so greatness will become normal. 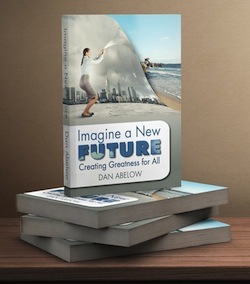 (Optional) AFTER the lead, BEFORE the first image: This is Chapter 2.5 from the new book, Imagine A New Future: Creating Greatness for All. It asks if we could we become a world where everyone can improve all the time — so much that it’s normal for the world to surge forward. A fully digital planet will transform how we live, earn, spend, learn, solve problems and be entertained. Picture a real-time global wave based on measuring success, with solutions delivered for personal gaps through optional Active Knowledge. Continuous online communities will add larger and more powerful solutions. 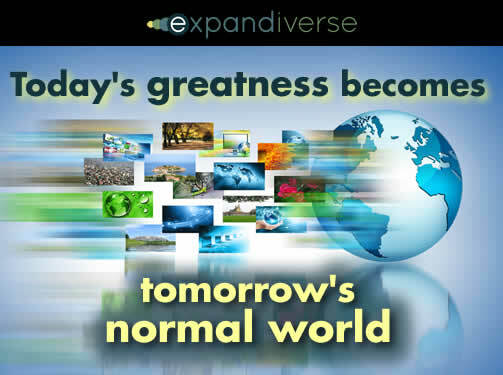 With Expandiverse Technology everyone can rise to greatness, so greatness will become normal. We all have different goals, but what if it became normal for most human beings to become quite good at many things? One output of Active Knowledge (AK) is that we may learn more quickly the best ways of achieving our goals, then reach for them. Wouldn’t most people choose to be successful? After all, when each new type of performance is learned, measured and delivered as part of doing, what kind of world would it be if far more people actually succeeded at what they set out to do? And what kind of world would it be if far more people took action to leap ahead quickly as they see others like them advance and prosper. 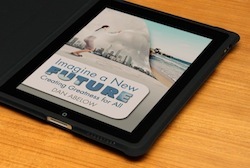 Well, our world might become one with huge, unexpected surges forward as people and businesses reach for what they want – creating new prosperity conditions as they expand activities, consumption and market sizes. Suppose we could all improve our abilities and lives faster and farther than what we can imagine today. What would you do with new abilities at your fingertips? Are you ready to dream again? 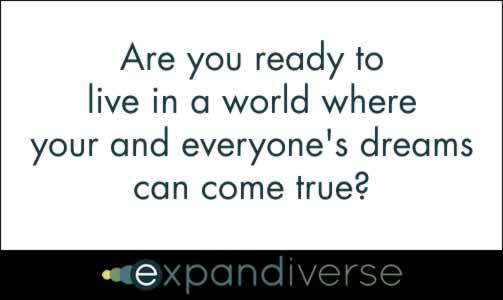 Are you ready to live in a world where your — and everyone’s — dreams could come true? Imagine a new app that continuously monitors your health from the smart phone you have with you throughout your day. Imagine it connected to back-end services that can provide you optional tips as you live your life — you turn its different kinds of tips on or off as you want them, and you use its guidance or not as you decide. At any moment you can glance at your personal dashboard and see how close you are to good health, your unique options, and the steps that you take (or not) to stay healthy. Your personal health is no longer an abstract goal. It’s steps you see, understand and control. You always see as much as you want about setting your personal goals, and receiving the guidance you want so you can do what you choose, as you go through your day. A world this dynamic, this self-driven, would surely become better and more enlightened, as well as fun and entertaining, when everyone could set personal goals and become what they choose. Many would enjoy wider options, a swifter pace and more progress — in both adventures and achievements. Once your Active Knowledge gets to know you, your possibilities can be endless — but more importantly, actually attainable. Isn’t this the ideal of what education is trying to teach today, from pre-K through Stanford and Harvard? An AnthroTechtonic society reaches everyone and enables them to think about what they want, take action, pursue goals and take the steps they want toward their life’s dreams.